The long over due Ondo-Ore road will be dualised if President Muhammadu Buhari is voted into office as the president for second term. Osinbajo also promised to ensure the upgrading of Adeyemi College of Education to a Federal University of Education. Osinbajo who stated that the administration investing massively in infrastructure, revealed that the present administration has spent N2.7 trillion on infrastructure since assumption of office, saying it is the highest in the history of the country. According to him, the Lagos – Ibadan Railway line project embarked upon by Buhari-led administration would be commissioned in a few days time. He explained that grand corruption perpetrated by the past administration was a major hindrance to the development of the nation. “They claimed to have spent Nigeria’s resources on infrastructural development, yet there was decay of infrastructure in almost every part of the country. “President Buhari was able to bring succour to the citizenry by rebuilding the nation through infrastructure and was committed to fighting corruption to save Nigeria’s economy from total collapse”, he said. Osinbajo reminded the people that only an honest and selfless leader like Muhammadu Buhari can be trusted with the country’s common wealth and bring about the needed development. Osinbajo enjoined Nigerians to re-elect President Muhammadu Buhari in order for him to take the nation to the next level of economic rejuvenation. He urged the people Ondo to vote massively for the truthfulness of President Muhammadu Buhari and candidates of the All Progressives Congress (APC) at the forthcoming 2019 general elections to achieve the dream of saving the nation from total collapse. Earlier, Osemawe of Ondo kingdom, Oba Victor Kiladejo appreciated the Vice President for giving the Yoruba people a true representation and assured him of the prayers and support of the people of Ondo kingdom. He described Prof Osinbajo as good ambassador of the entire Yoruba race, saying Nigerians are proud of him. Osemawe commended the Federal Government’s anti-corruption crusade which has sanitized the nation as well as its efforts at ensuring that the country witnessed massive infrastructural development especially in the area of railway and road construction. 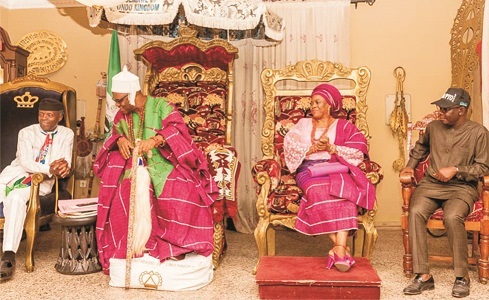 The Monarch also made case for the upgrading of the Adeyemi College of Education to Federal University of Education and the dualisation of the Ore-Ondo-Akure expressway. According to Osemawe, if the road is dualised, would expose the kingdom to investors.